For many Illinois residents, the fireplace serves as a symbol of warmth and comfort. The hearth provides these services in a literal sense, as well. Oftentimes, homeowners will fail to inspect their chimneys until something has gone wrong. If it’s been awhile since you’ve performed your own chimney inspection, we recommend scheduling 15 minutes to give your system a fall check. Any problems found should be rectified immediately to minimize the dangers and long-term damages. Elite Chimney & Masonry is proud to serve as your trusted source for chimney repairs in Chicago since 1998. Our experienced team is here and ready to provide the most long-lasting and affordable results possible. There are numerous signs that you should keep an eye out for when inspecting your chimney. Today, we’ll conclude our look into a few of the most common signs that it is time for professional chimney maintenance. If you have noticed any of the issues listed below or in our previous blog post, be sure to call us for quality service today! Another issue that moisture can create is spalling. This process is similar to the problems found with your mortar, as freezing temperatures lead to cracks. When your masonry is left with excess moisture, the surface can begin to flake away. Many people describe this as a peeling process, as the outer layers succumb to environmental factors. One of the biggest problems with spalling is that many homeowners see the process as slow and deem the damage minor. If not remedied proactively, your bricks and concrete can begin to crumble and fall apart. Our chimney inspection specialists can help to create affordable solutions to protect the structural integrity of your stack and the home that it supports. Excess moisture can also showcase its damaging abilities on the surfaces surrounding your fireplace. If your ceilings and walls seem to be discolored in a manner that radiates from the firebox, we recommend professional inspection services. Moisture, en mass, can create serious structural problems for your home. Deteriorating chimney waterproofing measures can allow water to seep into your drywall, creating unsightly outcomes that can hurt your home’s appeal. If left unfixed, this moisture can begin to seep into the framework of your home, creating structural concerns as well. Moisture in the home can also lead to mold, a noxious problem that can be costly for both your wallet and your family’s health if not proactively remedied. Heavy mold damage can necessitate remediation services, an intensive process that nobody wants their family to experience. A chimney inspection may provide beneficial results when it comes to waterproofing measures, so be sure to reach out Elite Chimney & Masonry today! One problem that often results in a call for chimney repairs for our Chicago team comes from an excess amount of smoke produced during operations. In many cases, the chimney liner can be to blame, as this crucial element is what is responsible for keeping everything sealed and safe. If you notice a lot of smoke, check to make sure that your vent is clear and open, as this lack of airflow can lead to oxygen imbalances. Excess smoke can be hazardous for your health and your home, as well as a sign of serious problems within your chimney. Elite Chimney & Masonry is here to deliver quality assistance to keep your family and property safe. 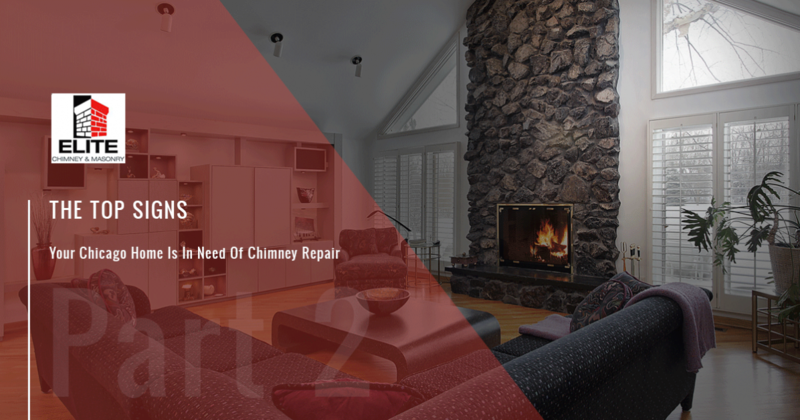 Call us today to learn more and to schedule your chimney inspection services. As an entry point into the home, your chimney may prove to be an ideal entrance for critters and pests. Damaged chimneys or improperly functioning dampers can allow any manner of invaders to enter your manor. A quick inspection may reveal that chimney repairs are needed to discourage pest invasions. Keep in mind that your home has numerous entryways, and the chimney may only be one factor to consider. From the crown to the flue, every aspect in your chimney needs to be in good condition to provide the best results. Illinois homeowners that experience problems should seek out quality assistance to find the best results for their property. If you’re on this page seeking chimney repairs in Chicago, Elite Chimney & Masonry is here and ready to help. Contact us today to schedule your service!